Delhi Capitals Predicted Playing 11 for Today’s Match. 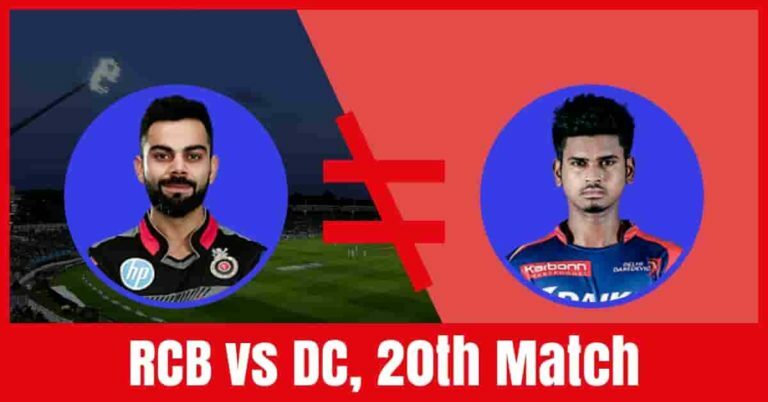 Who Will Win The Match Today of DC vs RCB 20th Match Indian Premier League 2019? The first match of Super Sunday and a most exciting one as RCB has to break their losing streak. Royal Challengers Bangalore is all set to take on Delhi Capitals on Sunday, April 07, 2019, at M.Chinnaswamy Stadium, Bengaluru. If you are looking for Dream 11 free teams for the grand league, the best choice for captain and vice-captain, Royal Challengers Bangalore vs Delhi Capitals full squad then you are the right place. We have covered all the above information in details. Make sure to read the complete post if you want to increase your chance of winning to 100%. All the information in this post are almost 100% accurate and taken from very reliable sources. Utilize it and make a perfect team to win any fantasy cricket leagues. 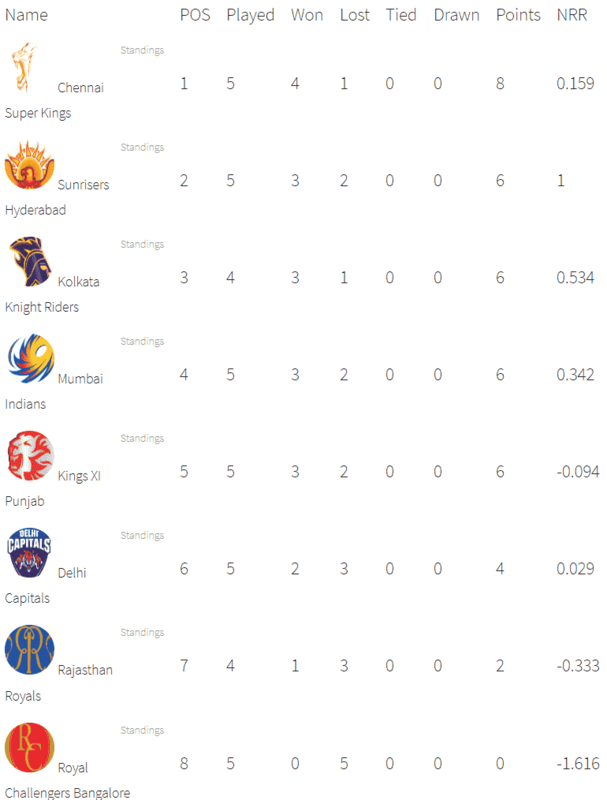 Royal Challengers Bangalore had a worst IPL so far. They have played 5 matches and have lost all five matches. They are at the bottom of the points table. They have lost their last match against KKR by 5 wickets. Prior to that, they have lost against RR by 7 wickets, lost against SRH by 118 runs, lost against MI by 6 runs. Parthiv Patel, Virat Kohli and AB de Villiers are the top scorers of Bangalore team. They have scored 163, 162 and 156 runs. Yuzvendra Chahal and Navdeep Saini are the top wicket-takers. They have taken 9 and 2 wickets respectively. On the other hand, Delhi Capitals have played 5 games, won 2 and lost 3 games. They are in the 6th position of the points table with 4 points in their pocket. They have lost their last match against SRH by 5 wickets. Prior to that, they lost against KXIP by 14 runs, won against KKR in a super over and lost against CSK by 6 wickets. Rishabh Pant, Shikhar Dhawan, Shreyas Iyer, Prithvi Shaw and Colin Ingram are the top scorers of Delhi Team. They have scored 158, 152, 148, 141 and 102 runs. Kagiso Rabada, Ishant Sharma, Sandeep Lamichhane and Chris Morris are the top wicket-taker. They have taken 7, 4, 4 and 4 wickets respectively. Prithvi Shaw, Shikhar Dhawan, Shreyas Iyer, Rishabh Pant, Colin Ingram, Chris Morris, Kagiso Rabada and Sandeep Lamichhane are the key players of Delhi Capitals Team. Shreyas Iyer will lead the DC team. Dc may play with the same playing 11. Prithvi Shaw, Shikhar Dhawan and Shreyas Iyer will lead the batting department. Chris Morris and Axar Patel will play as a key all-rounder. Sandeep Lamichhane, Ishant Sharma and Kagiso Rabada will lead the bowling department. Shikhar Dhawan and Shreyas Iyer are the most valuable players of the Delhi Team. All-Rounders: Axar Patel, Chris Morris, Rahul Tewatia. Bowlers: Sandeep Lamichhane, Ishant Sharma, Kagiso Rabada. Shreyas Iyer(c), Prithvi Shaw, Nathu Singh, Shikhar Dhawan, Jalaj Saxena, Rishabh Pant(w), Avesh Khan, Rahul Tewatia, Trent Boult, Colin Ingram, Keemo Paul, Chris Morris, Sherfane Rutherford, Axar Patel, Kagiso Rabada, Hanuma Vihari, Ishant Sharma, Bandaru Ayyappa, Harshal Patel, Sandeep Lamichhane, Colin Munro, Ankush Bains, Amit Mishra, Manjot Kalra. Virat Kohli, AB de Villiers, Marcus Stoinis, Navdeep Saini, Pawan Negi, Parthiv Patel and Yuzvendra Chahal are the key players of Royal Challengers Bangalore Team. Shimron Hetmyer may replace Moeen Ali. Umesh Yadav may replace Mohammed Siraj. Washington Sundar may play in place of Akshdeep Nath. Marcus Stoinis will play as a key all-rounder. Batsmen: Virat Kohli, AB de Villiers, Moeen Ali/Shimron Hetmyer/Heinrich Klaasen, Akshdeep Nath. All-Rounders: Marcus Stoinis, Shivam Dube. Bowlers: Yuzvendra Chahal, Tim Southee, Navdeep Saini, Mohammed Siraj/Washington Sundar/Umesh Yadav. Virat Kohli(c), Parthiv Patel(w), Umesh Yadav, AB de Villiers, Shimron Hetmyer, Marcus Stoinis, Heinrich Klaasen, Moeen Ali, Himmat Singh, Akshdeep Nath, Washington Sundar, Pawan Negi, Prayas Barman, Tim Southee, Navdeep Saini, Devdutt Padikkal, Yuzvendra Chahal, Colin de Grandhomme, Mohammed Siraj, Gurkeerat Singh Mann, Shivam Dube, Kulwant Khejroliya, Milind Kumar, Nathan Coulter-Nile. The pitch of M.Chinnaswamy Stadium, Bengaluru will favour the batsmen. The ball will come nicely into the bat the batsmen can easily play lofted shots. The spinners can also get some purchase in the latter half of the match. A high score is predicted today. The weather of Bengaluru is forecasted to be partly cloudy and it will remain the same throughout the day. A hot day is predicted. There is no sign of rain today. The temperature is expected to be 35-Degree Celsius and the humidity to be 17%. Dream11 Fantasy Cricket Tips: The weather condition may favour the seam bowlers initially. Royal Challengers Bangalore fans will be delighted to know that RCB has beaten DC in all the five matches they have played. According to crix11 astrology cricket match prediction RCB will win the match today. The team winning the toss should opt to bowl first as the team batting second has won 41 matches out of 76 matches. According to crix11 astrology prediction, DC will win the toss and opt to bowl first. This is it for Today’s RCB vs DC Dream11 Fantasy Cricket Prediction 20th Match. What is your best team? What do you think Who Will Win Today? Leave a reply in the comment section.